Sorry for the delay on this. Ti was wiped out by illness for a while, and has also started a new job ... and then I also had a week from hell with a shouty demon baby who did not want to go to sleep! I'm not entirely sure what the issue was, but I think maybe his top front teeth are coming in and he is not happy about it - though he's calmed down a little now (famous last words?). 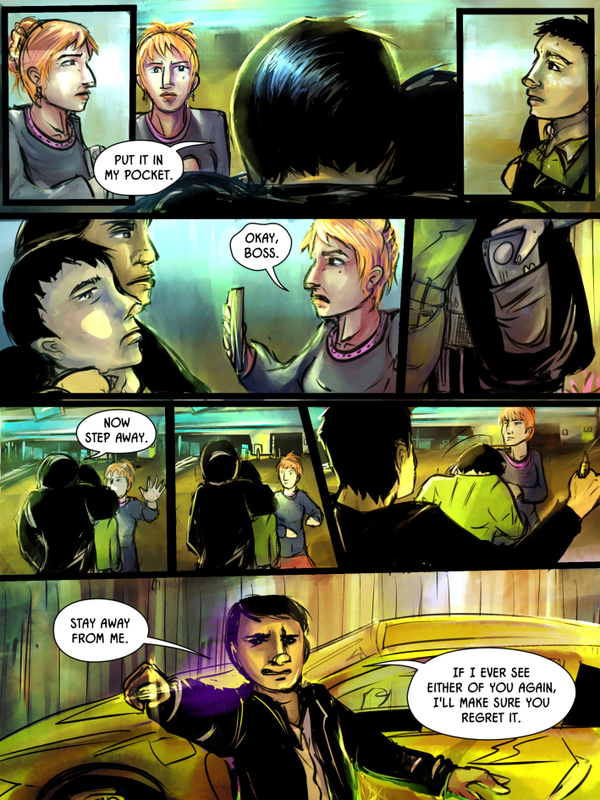 Still, we've only got two / three more pages to go on this story, so we're very nearly done here! That being the case, I wanted to make a promise to you that I'm going to start posting on social media about my progress behind the scenes. I'm saying this because if I say it to you, I'm far more likely to actually do it - and I've got to a) do a bunch of tidying up, and b) get my arse in gear if I'm going to take back the job of, you know, producing comic pages ... So yeah, check in with either my Facebook, Twitter or G+ accounts to see what I'm up to in the coming weeks (I post the same stuff on all of them, so you only need to pick one :P). I can't promise a fount of activity to begin with, but I will be Doing Things. ALSO, I have a couple of pieces of Spiderforest news! 'My Hero!' follows the adventures of a Guardian named Hasera who cannot perform even the most rudimentary requirement of her job: Healing. Hasera has been reading Harlequin romance stories since she joined The Order of the greatest Champion who ever lived across the 9 planes: Lark. One day she wishes to meet the great and chivalrous hero of her dreams. Remember two important sayings: "Be careful what you wish for." and "Never meet your idols." And secondly ... yes, it's that time again! 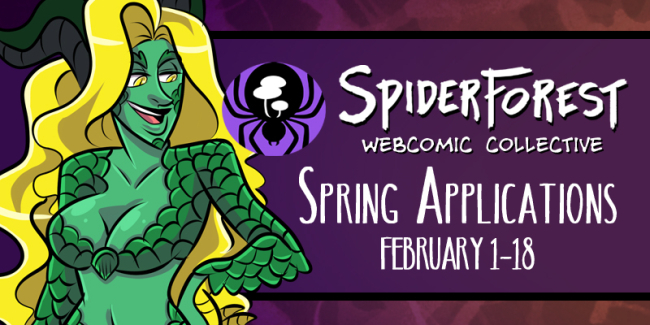 The Spring Application season for the SpiderForest webcomic collective starts on 1st Feb, which is in ONE DAY, GUYS! So if you fancy joining our lovely crew, take a look at the apply page on the SF website for more info. Note that if you have applied to SF before, all comics are now REQUIRED to seek critique from our forum community before submitting a second application - see the apply page for more details.